New website coming next week. Check back for the link. Books, books and a list of books to read. New stuff for my apartment!! I can't tell you for how long or for how many different reasons I enjoyed listening to this song. But it's been long and many. Sims 4 coming out in 2014?!?!?! Ps- happy Friday the 13th! Warner Bros is making Fantastic Beasts and Where to Find Them into a film! It'll feature the imagined author's adventures in life as he writes this beginner Care of Magical Creatures textbook. Can I say.... I am incredibly thrilled! And it's such a unique and unexpected way to go back into the world of Harry Potter. So. Pumped. Read more about Jk Rowling's screenplay debut here. Wednesdays are pretty crazy for me. I have multiple scheduled meetings that occur every week and then somehow a ton of one-time meetings always get scheduled too. There are some Wednesdays where I don't get to my desk between 9-3 PM. Lately I've had to leave around 4:30 to walk the dogs and feed them and then I'll have to log back in to finish the bare minimum of what had to get done. It's a crazy day and somehow I always forget just how crazy Wednesdays can be. I'm just glad I can log in from home so that I can take care of business there and not have to stay at work extra late and then drive home and try and do everything. My job's a little crazy now too but I'm having fun with it and starting to get past the big changes and on to developing a routine. Although usually when things feel Ike they're settling down something unexpected happens to liven things up. Luckily I'm the type of person who likes that and likes juggling multiple projects and roles at once so it's just exciting for me. Plus I think I've learned to put everything into perspective and not get stressed out when projects or priorities change. Speaking of livening things up, I'm teaching my first TNU class (our in-house university) starting at the end of the month so that'll be a fun new challenge. Beginner Excel, anyone? If this isn't pure relaxation, I honestly don't know what is. 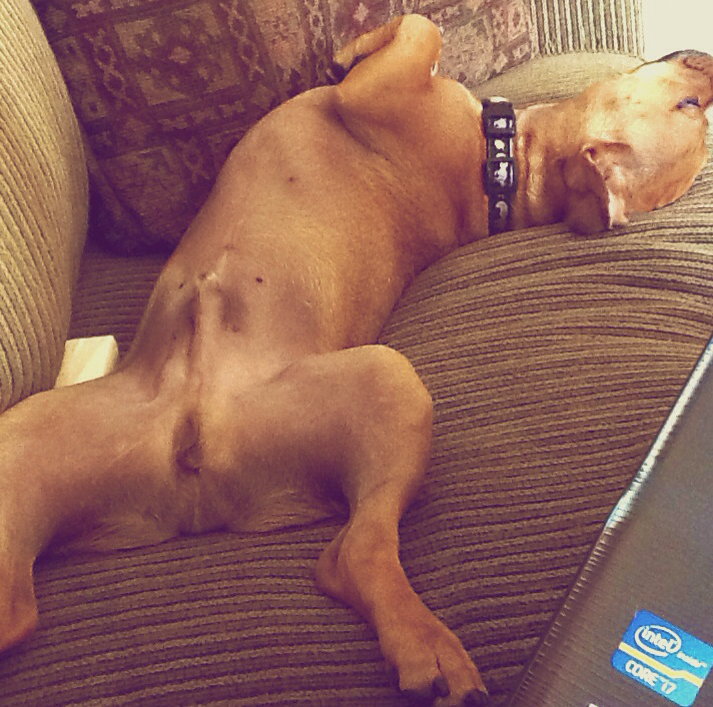 Completely sprawled out for the world to see, no cares in the world and dreaming. I found out today that this poor guy and his sister caught some fleas so I spent a good part of today doing and purchasing various things to rid them of this biting menace. It doesn't seem widespread throughout the house and I don't have any bites so I think I caught it early enough. FYI if you're moving from the desert to the east coast, your dog will need some type of flea protection. Just saying. Preventative measures. If you didn't notice, I (accidentally) took a week off last week. And rather than go back in time and write back-posts, I'm just gonna go ahead and move forward. Besides, they'd probably be terrible anyway! Short and pointless. Anyway, the reason I didn't blog last week was because I moved! So it took a while to get everything set up and get the routine down with me and the dogs. The three of us share a two bedroom apartment on the bottom floor, with a huge kitchen, steps away from a lake and park and that smells like bakery just down the road. It's plenty of space for the dogs to run around and play in so I'm quite happy with that. We go on at least four walks a day around the neighborhood and around the lake and we cuddle every night under the blankets. I have to say, it's not a bad life. Tonight I leave you with a video of a song that's been stuck in my head for weeks. I'm hoping either you'll get it stuck in yours too or this exercise will release it from mine. Ben likes having his bone and his sister's bone at the same time. Ben gets real jealous when Penelope has one. 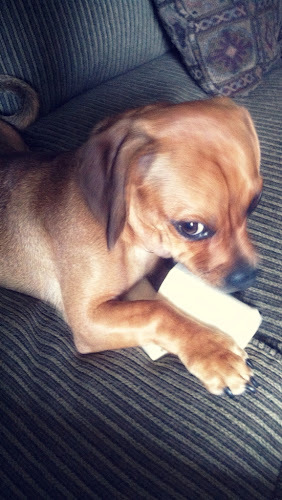 Ben gets suspicious when you take pictures of him with his bones.